Hello! Taylored Expressions and Fancy Pants have partnered together to show how well both company's products pair together. For more details and inspirational projects, please visit the TE blog. Plus, there are a couple of prize packs available! Taylored Expressions is giving away a Butterfly Parade stamp set along with a Fancy Pants Designs As You Wish Collection Kit! To enter, visit the TE Blog! PLUS, Fancy Pants Designs is giving away a second prize pack! Head over to the Fancy Pants Designs Blog for all the details. Thanks so much for stopping by and Good Luck! Beautiful cards and tags! I love the flowers stamped in black on the book print! Very awesome. Love the multiple exampled. Gorgeous cards and tags! I love the layering and patterns, thanks for sharing. Wow Stephanie! What an amazing collection of tags! Love all the layers and details! Your stitching looks fantastic! Stephanie, I LOVE them. What awesome set of cards and tags! 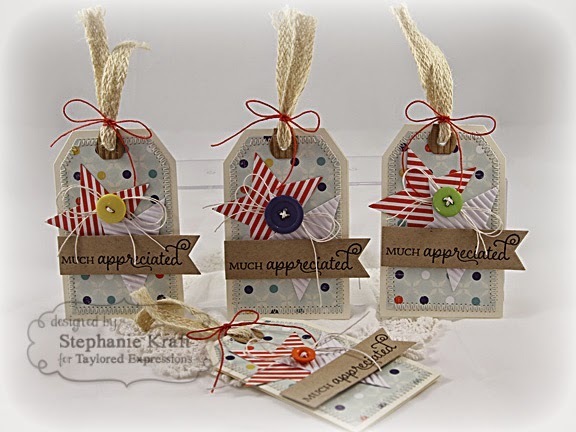 Love your cards and tags - gorgeous. Fabulous cards and tags! So sweet and soft! Love the black inked flowers on the book prints! Fancy Pants and TE go great together! Love the cards and tags... awesome! Love the floral stamps and those star dies!